George Washington Peacock was born about 1841 in Wayne County, North Carolina and died about 1862 in an unknown place. Dates for birth and death are estimated. He lived to be about 21 years old. Recorded as family #34: Stephen Peacock (age 35)NC, Rose Ann (age 26)NC, S. M. (age 12)GA, A. E. (10)GA, George W. (8)GA, John W. (7)GA, Marthey F. (5)FL, Rhoda A. (5)FL. Recorded as dwelling #163: John A. Kelly (age 46), Sarah M. Kelly (age 21), Amanda Kelly (age 11), Francis Peacock (female, age 15), James Peacock (age 6), and Washington King (age 10). John is a farmer and estimates the value of his real estate to be $200 and personal property at $400. John was born in NC, his wife in GA and all of the children in FL. John can read and write while Sarah cannot. Click on any of the News, Events, or Discoveries buttons above to see historical things that happened during George Peacock's life. These are only some of the major events that affected the life and times of George, his family, and friends. For example, George is 1 years old when Second Seminole Indian War ends and thousands of Seminole Indians are forced to move west of the Mississippi. 12 1853 The process of creating steel is invented by Besermer in Britain and Kelly in the U.S.
18 1859 Charles Darwin publishes "Origin of Species" and begins the evolution theory. 20 1861 NEWS HEADLINES: American Civil war begins at Ft. Sumter, located in Charleston Harbor, VA.
21 1862 NEWS HEADLINES: May 20, 1862 the US government passes the Homestead Act to provide cheap land for settlement of lower Southeast and West. 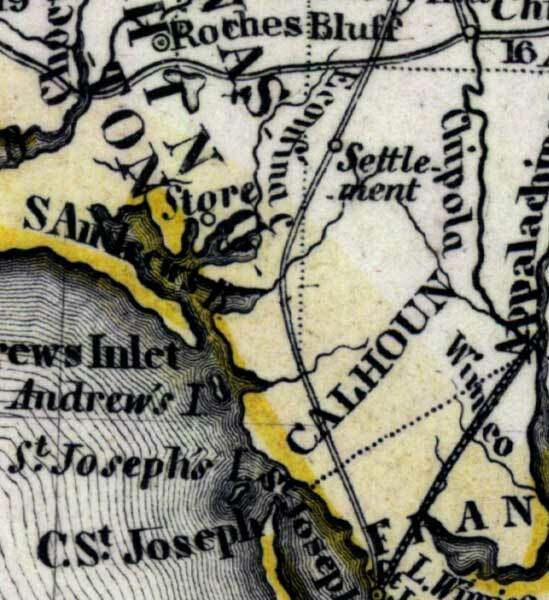 1 1842 Second Seminole Indian War ends and thousands of Seminole Indians are forced to move west of the Mississippi. 14 1855 Third Seminole Indian War begins. It ends three years later when Chief Billy Bowlegs and his band are forced to move from Florida. 19 1860 Presidential election puts Abraham Lincoln in office. The campaign has heated the issues regarding slavery in the south. 21 1862 May 20, 1862 the US government passes the Homestead Act to provide cheap land for settlement of lower Southeast and West.